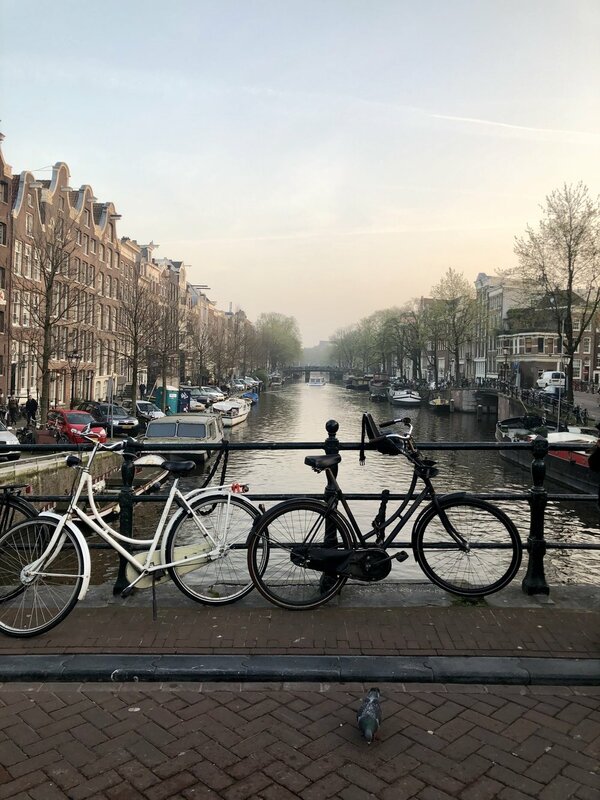 Spoiler alert: I am obsessed with Amsterdam! I’ve never been so taken with any city before - loved the culture, the ambiance, the people, the light…EVERYTHING. So here’s a quick recap — with more posts on Dutch style to come! Ok, first things first - where to stay. I took my friend Page’s recommendation & stayed at The Pulitzer hotel & it was perfect. As you can see below, The Pulitzer comprises 25 historic buildings dating from 1600’s on, all ringed around a lovely courtyard….I’ve never seen a hotel quite like it! …but don’t let the historic feel make you think this is grandma’s attic! The interior design is completely fresh & modern, with jewel-toned color, lush fabrics & lots of modern art. And of course, this being Holland - there are flowers EVERYWHERE in the hotel! They have a charming restaurant called Jansz so if you’re jetlagged or just want to collapse after long day of walking around Amsterdam (we averaged 10 miles a day, no joke! ), the hotel restaurant is great option. They also have a cozy, moody little bar that is divine. OK - now to go exploring…. Antiquing - I hit places at the high end and low end, with good luck all around! You can’t go wrong visiting the Antiek Centrum Amsterdam, which is enormous & filled with decorative vintage accessories, prints, Delft tiles — things that can fit easily in your suitcase. This is a GORGEOUS antiques shop on Prinsengracht with pieces from all over Europe. 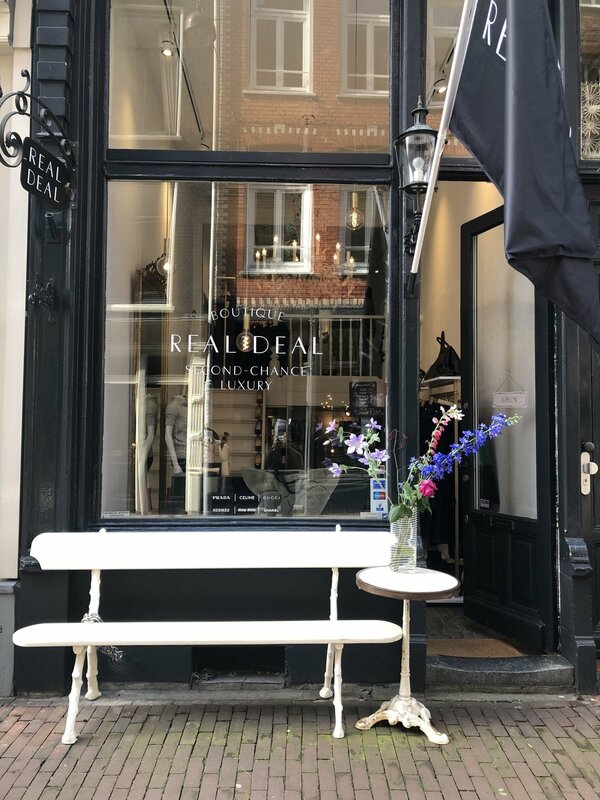 Amsterdam is a town that REALLY gets vintage & used clothing — below is just one of many, many such places we found…. 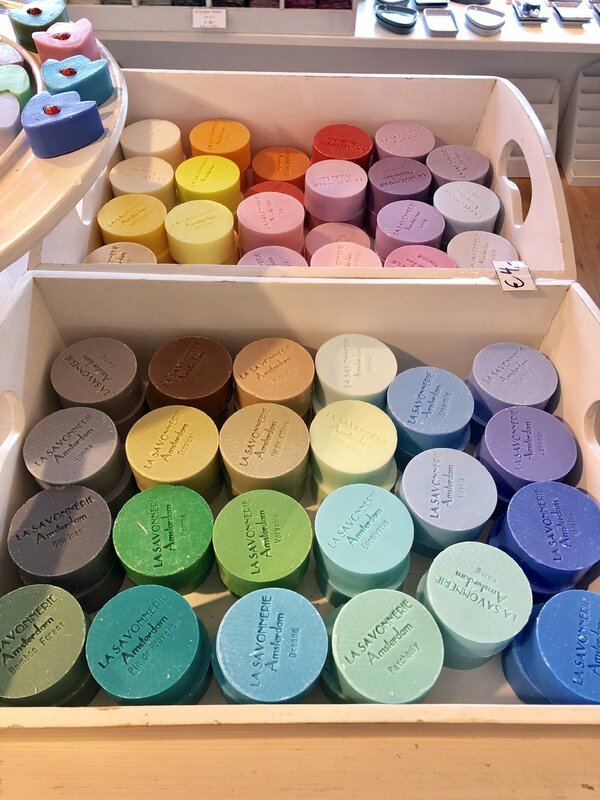 You won’t find a cuter shop anywhere than La Savonnerie! They make all their own soaps & accessories locally. AND lucky for us Americans, they actually seem to have a working website & can take online orders. This was the #1 thing I wanted to do & the same was true for my 18-year old daughter. So it was a bit concerning when planning our last-minute trip to realize that most of the tickets are sold out 8 weeks in advance; ALL of the tickets are sold online, none at the box office. However, our Concierge told us to log into the online lottery at 8:30-ish AM (the lottery goes live at 9 am every morning) & we were lucky enough to get tickets that way. Galleries everywhere - I picked up a wonderful collage/print & few other pieces of art at local galleries. I particularly liked Galerie Atelier Stam, which includes the proprietor’s working studio right in the middle of the showroom. Beautiful work!! Ok, that’s all for now! Happy early Spring to everyone! !